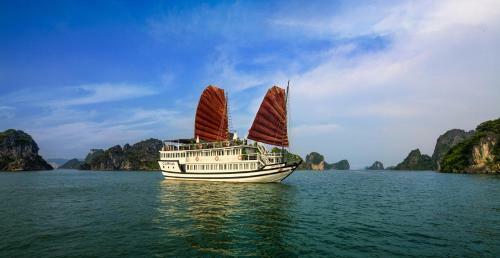 Carina Cruise is a traditional wooden sail boat which cruises along the UNESCO World Heritage Site of Ha Long Bay. It features a 24-hour front desk and offers comfortable rooms with spectacular views of the sea. Featuring oriental décor, air-conditioned rooms are equipped with a wardrobe, minibar and a TV with cable channels. The en suite bathroom comes with shower and free bath amenities. At Carina Cruise, guests can enjoy a massage or activities such as fishing and snorkelling. The sun terrace allows guests to chill out with a book or drink. Luggage storage is also available. The on-board restaurant serves delectable Vietnamese and international cuisines. A variety of drinks and beverages are offered at the bar. Room service is provided on request. Carina Cruise is within 5 km to the city centre. Noi Bai International Airport is approximately a 3-hour drive away.